(1945-) Erol Erdinç attended the Ankara State Conservatory, and went on to the Ecole Normale de Musique, where he studied composition with Nadia Boulanger, and conducting under Jean Martinon and Pierre Dervaux. He has been a guest conductor for a large number of orchestras in Europe and America, and gained fame directing premiere performances Turkish and foreign composers' works. Erdinç prepared programs for French television introducing Turkish music, and served from 1986-1987 on the jury of the Grand Concours de Musique. 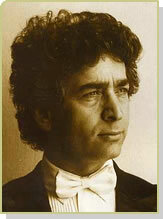 He presently directs the Istanbul State Symphony Orchestra.